This month’s walk is quite long, the return route is around 12 miles, but you can shorten it by using public transport. Trains run from Reading to Tilehurst or Pangbourne stations, which are both on the route. On Saturdays, Sundays and Bank Holidays, you could take a boat trip to Mapledurham or from Caversham Bridge with http://www.thamesrivercruise.co.uk and walk back. Alternatively, as the entire route is easily passable on bicycle and fairly flat, it’d also make a great cycle route. Unless you’re taking the train part-way, park at the car park off Richfield Avenue near Caversham Bridge and walk past the convenient ice-cream shop (if you can) to join the towpath on the south of the Thames. Head west away from the Bridge, following the signs for the Thames path. This starts off tarmaced, but soon becomes unmettled after you pass Rivermead Leisure Centre on your left. As you walk along, admiring the big homes with their own boat houses and moorings facing the river on the opposite bank, you can dream about which one you’d buy with that lottery win. Watch out all along for new families of ducklings, cygnets and goslings as you follow the river, as well as the athletic looking rowers canoeing up and down. After about a mile, you’ll pass Coombe Bank, a prehistoric earthworks site of local importance near Little John’s Farm on your left, before you reach St Mary’s Island in the middle of the river. Soon after that, the railway sidings appear, rising up high above you, and you’ll hear the trains rushing past heading west, or stopping at Tilehurst station. A couple of miles after the sidings appear, you’ll reach a sign telling you to follow the Thames path up onto the road. It’s not possible to continue on the towpath here, as a private house blocks the way. Take the steep railway bridge which comes out next to the Roebuck Hotel and follow the road to the right for a short distance. Watch out for the Thames Path sign pointing down a set of stairs to the right, which leads out into a housing estate. Head left from here up the steep hill to a T-junction, where a right turn picks up the Thames path again on Mapledurham Drive. You can shop at some of the interesting cottage industries are being run from the local gardens here. The route then runs through a field, taking the right fork across to the weir next to Mapledurham Lock, which became the first mechanical lock on the Thames in 1956. Over the lock, the route rejoins the towpath through fields of buttercups, buzzing with dragonflies. 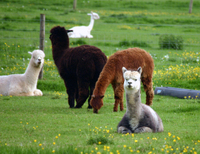 Just as you reach the gate to leave the last meadow, look out across the river and you may just glimpse alpacas watching you from their field. Just before you reach Pangbourne, you’ll pass through the National Trust owned Pangbourne Meadow (free of charge) before reaching the toll bridge that crosses between Pangbourne and Whitchurch. The current bridge is the third on this site and was built in 1902. The Toll House was built close by in 1792 so tolls could be collected from the porch door. A brick built booth is now used to collect car tolls (20p). Both the Toll House and the Bridge are now designated Grade II Listed Structures. The footpath continues to the left after the toll booth towards Mill House, which affords a lovely views of the bridge. Here turn right through a wisteria-covered alleyway and through the churchyard of the Church of St Mary the Virgin. Opposite the church is the Greyhound pub, but as this is closed on a Sunday afternoon, I visited the rather eclectically decorated Ferryboat Inn, which has a few too many lace tablecloths for my liking, but is definitely worth a look for its kitsch value. From here you can turn around and double back home, or pick the train up from Pangbourne Station, or continue through Whitchurch to travel back north of the river. To join the path, continue on the High Street through the village to Hardwick Road on the right (signed for Path Hill). Head up this road (there is a small path) for about 1½ miles, past Bozedown Farm and Vineyard, home to the alpacas, where the road bears left. Here you need to continue straight, towards Hardwick House, where Charles I played bowls and which reportedly provided the inspiration for Toad Hall in Wind in the Willows. At the East Lodge, the track starts to narrow. At the end of this track, you’ll come back out White House, where you’ll meet the road again. Turn right and then look for the footpath on the left again as you reach the telephone box. This follows along the back of Mapledurham House, which has been home to the Blount family for over 500 years and houses the last working watermill on the River Thames. The house is famous for its film and television connections; the Forsyte Saga, Wind in the Willows, The Eagle has Landed, Inspector Morse, Sharpe, and Class Act have all been filmed at Mapledurham. If you are there over the Bank Holiday weekend, a “Live Crafts” exhibition is being held at the house. From the house, continue along the track past Park Farm and the turn-off for New Farm towards Gravel Hill, then pick up the Warren, which runs along the front of all those lovely grand riverside houses to come out on the road back to Caversham Bridge, where there’s been a crossing since 1231. Cross over today’s bridge (replaced between 1924 and 1926) to come back to the car park on the other side.